Cheshire can never have been particularly important for the Corn Bunting, as a bird primarily of arable land, but in the last twenty years the species has undergone a major contraction in range within the county, and it is now one of our scarcest breeders. National surveys (BTO) show that the population fell precipitously from its peak in 1973, with an 91% drop in thirty years from then. Much of that drop was during the 1970s and early 1980s, but from the end of our First Atlas (1984) to the start of this Atlas (2004), their breeding numbers nationally have seen another 75% fall. Against that background, it is no surprise that it has been lost from Wirral, and the casual reports submitted to CBRs over the last 20 years have shown a steady decline in Cheshire. The species is down from presence in 260 tetrads in our First Atlas to just 36 now. It is completely absent from its former strongholds around the Dee, the south Mersey and the lower Weaver valley. A few new sites, including seven tetrads in the southern half of the county that were not occupied twenty years ago, might give some cause for optimism about the Corn Bunting’s prospects. They strongly prefer agricultural areas with mixed arable rotation, and avoid improved grassland. Most of the Cheshire birds are now found in locations where more than half of the land area is devoted to growing cereals. This type of habitat is mainly present in the north of the county, with the species’ strongholds around Risley and Hale. Farther north, the Lancashire and North Merseyside breeding bird atlas (1997-2001) found a healthy (although much reduced) population, with Corn Buntings present in almost all of the lowland non-urban tetrads between the Mersey and the Ribble. In this survey, nearly all birds were found in agricultural habitats, with the majority of the codes recorded being E3 or E4 – tilled land or mixed grassland and tilled farmland – or E6, ‘other farming’. 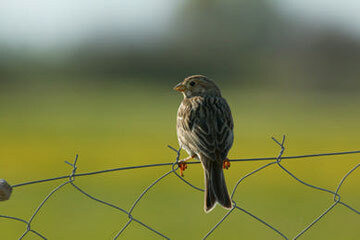 Six tetrads had records of birds carrying food for their young, and in another six the observer noted pairs of birds, but most Corn Buntings were detected by the observer hearing the jangling song of the male, perhaps followed by a sight of the bulky bird flying across the top of the crop, with his legs characteristically dangling. This is an unusual passerine species in several ways. They are sexually dimorphic, with males much larger than the females. Some female Corn Buntings pair with an already-mated male, a strategy that clearly works because both females nesting with a polygynous male have similar reproductive success, and both are more successful than a females nesting monogamously (Hartley et al 1995). They are one of the latest breeding passerines in Britain, with a peak of egg-laying in late June, but covering an extended period from late May to late July. Some broods are attended by ‘helpers’, especially juvenile females that fledged earlier, that assist the parents in feeding the chicks; these are usually half-siblings from a polygynous father. The nests are almost always on the ground in cereals, field boundaries and rough grass. A clutch of 3-5 eggs is incubated for about 12-14 days, and chicks leave the nest from about 9 days of age, well before they can fly. The chicks are fed almost entirely on invertebrates, especially sawflies, hoverfly larvae and beetles, and loss of these insects is probably instrumental in the decline of the Corn Bunting. After fledging, ripening cereal grain becomes the main food, for adults and juveniles alike. Few of the Cheshire tetrads now hold more than one or two pairs, and – given its long singing period – it is possible that some of the records refer only to birds moving through. The present county population is unlikely to exceed 70 pairs.